When the Nashville Predators traded for Cody Franson and Mike Santorelli on February 15, I, like everyone else, was ecstatic about the increase in the lineup depth. Nashville was sitting comfortably with a six point cushion on the St. Louis Blues in the Central Division standings and five points ahead of the NHL’s second placed Anaheim Ducks. One month later, the Predators’ point lead has evaporated and are now second in the Central Division behind the Blues due in part to a 6-game losing streak. 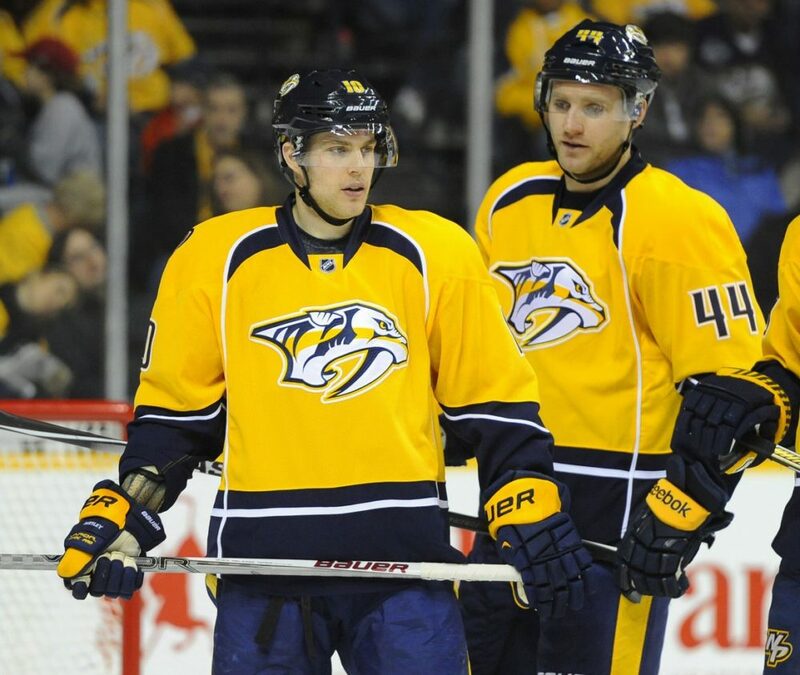 Both are familiar with some of the current Predators, having began their NHL career in Nashville. Franson, selected 78th overall (third round) in 2005, played in 141 games previously for the Predators, while Santorelli, selected 178th overall (sixth round) in 2004, played in 32. Nashville’s captain Shea Weber is childhood friends with Franson. The problem is not Franson and Santorelli interfering with the Predators’ chemistry. However, their additions have not worked out as well as they had hoped. One of the reasons Poile sought a defenseman prior to the trade deadline was to replace Ryan Ellis, who missed 24 games due to a lower-body injury. Once Ellis returned, Franson saw his ice time plummet. Without Ellis in the lineup, Franson’s average time on ice was 17:40, but with Ellis in the lineup, it is 14:16. Neither times compare to the 21:23 logged with the Toronto Maple Leafs earlier this season, but no one expected Franson to amass that much ice time with the likes of Shea Weber and Roman Josi on the roster. Part of the reason the 27-year-old’s average ice time dips 3:24 with Ellis in the lineup is because he is the odd man out in Laviolette’s power play unit. The defensive units include Weber with Josi and Seth Jones with Ellis, while Franson, who is 16th in the NHL and a team best in power play points with 16 (4 g, 12 a), rides the pine. The last time Franson saw substantial power play ice time, excluding 9 seconds in a March 9 game against the Arizona Coyotes, was five games ago against the Winnipeg Jets on March 7. As the 6th worst team in the League on the man advantage, having Franson on the ice to improve a brutal power play makes sense. Laviolette’s misuse of Franson thus far is disappointing. With Ryan Ellis back, Cody Franson is basically a No. 6 that gets no PP time. What in the world was the point of that trade? Though you have to applaud a player for having aggressive scoring instincts, there is a point where the will to score turns into just being selfish. Joining a new team, there is a yearn to get the first goal out of the way. Santorelli has had multiple opportunities but cannot seem to score. In 13 games, the 29-year-old has just one assist and a -2 rating. Santorelli is close to notching his first tally, which is probably why he is replacing an injured James Neal on the Filip Forsberg and Mike Ribeiro line. The Predators would like to see a contribution from Santorelli sooner, rather than later. Subscribe to our Predators stories to get email updates every time a new story is published. Colin Fitts is a Nashville Predators staff writer for The Hockey Writers. You can follow him on Twitter, @FittsTHW.